And now to show you the few projects that I completed in anticipation of hosting a baby shower at my house. Of course, originally I had a huge to-do list that I wanted to complete but the reality of my pregnant state honed it down to just a few important items. I bought this Echino Nico London fabric at on online clearance sale probably a year and a half ago with the idea that I would use it for pillows in my den area. I kept waiting to make the pillows because the hubs is making me some built-in bookshelves and these pillows were to be part of the window seat area. Well the bookshelf project is on a bit of a hold right now, but I decided to go ahead and make the pillows to spruce up that area a bit. 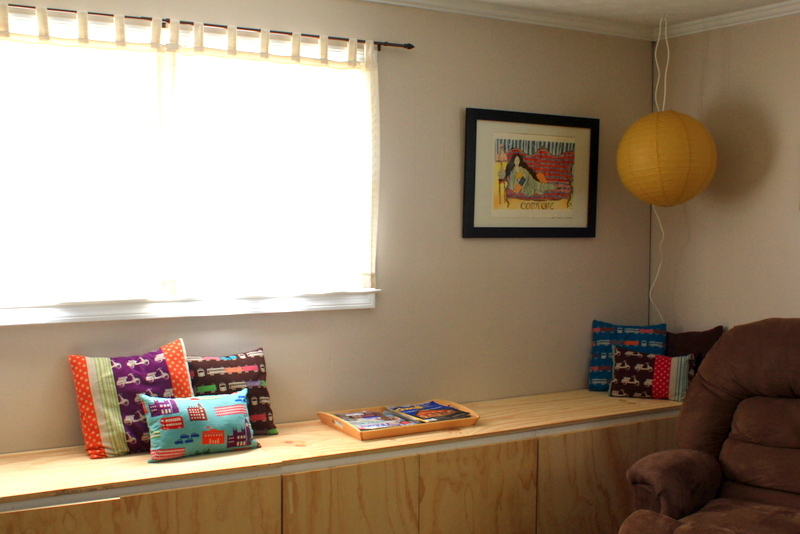 The bookshelves will be built on top of this build-in cupboard (now hiding many of Oliver’s toys) and so I will just pull all the pillows to the middle window-seat area when they finally are finished. I la,la love how it turned out! I am a bit of a book nerd and have a love affair with England so this fabric suits me perfectly. I also had my sister come over and help me hang some art work and lanterns that I had sitting around waiting for this room to be completed. (Art work is by the very talented Mary Lekoshere) Now it looks like a cozy little space and I am so happy to have pulled this nook together. Ignore the fact that the pillows are sitting on raw boards- remember the whole work-in-progress fact and appreciate that there is at least one part of this project completed. I need to take some more pictures in the later afternoon because the sun was shining directly in the window- making it impossible to get a shot of the entire wall but I think you get the general idea. 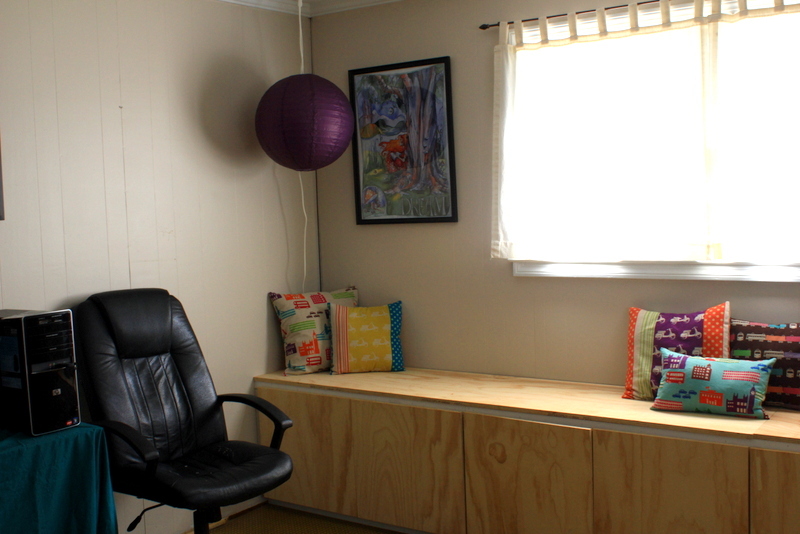 I have about a yard of the tan London print left over as well as some nice-sized scraps of the other prints so I hope to make a quilt for the day bed also located in this den to really pull the room together. As a final note, I highly recommend this linen-cotton blend fabric as the perfect weight for pillows! It sews like a dream and creates a nice thick, but not too heavy pillow cover! Also I am lazy and create envelope backs for all my pillows! Super easy and you don’t have to fiddle with zippers, buttons or hand-sewing. This entry was posted in For the home and tagged echino nico fabric, London fabric, pillows by oliver's fancy. Bookmark the permalink. Ah! I LOVE those pillows!!! !